Tax payers seeking non-deduction of tax from certain incomes are required to file a self declaration in Form No. 15G or Form No. 15H as per the provisions of Section 197A of the Income-tax Act, 1961 In order to reduce the cost of compliance and ease the compliance burden for both, the tax payer and the tax deductor, the Central Board of Direct Taxes (CBDT) has simplified the format for self declaration in Form No.15G or 15H. The procedure for submission of the Forms by the deductor has been specified under rule 29C of Income-tax Rules, 1962. Under the simplified procedure, a payee can submit the self-declaration either in paper form or electronically. The deductor will not deduct tax and will allot a Unique Identification Number (UIN) to all self-declarations in accordance with a well laid down procedure to be specified separately. The particulars of self-declarations will have to be furnished by the deductor along with UIN in the Quarterly TDS statements. The requirement of submitting physical copy of Form 15G and 15H by the deductor to the income-tax authorities has been dispensed with. The deductor will, however be required to retain Form No.15G and 15H for seven years. These changes will come into force on the 1st day of October, 2015 as per the Notification issued vide S.O. No.2663 (E) dated 29th September 2015. This is a welcome decision for honest tax payers but a cautioning alarm for habitual violators. It is felt that it is more revenue oriented and is more beneficial for the income tax department than that of the tax payers. However as per section 197A(2) The person responsible for paying any income of the nature for which the declaration is made in form 15G/15H shall deliver or cause to be delivered to the Principal Chief Commissioner or Chief Commissioner or Principal Commissioner or Commissioner one copy of the declaration form 15G/15H on or before the seventh day of the month next following the month in which the declaration is furnished to him. The deductor has to check whether person providing the form is eligible to submit requisite form or not and that too according to particulars submitted by the person. Thus there is more responsibility on the deductor now than was in the past, who now has to ensure that the person submitting these forms is in-fact eligible to submit either form 15G or 15H. The eligibility will be measured on two counts. One pertains to the age of the deductee and the other pertains to the non taxable portion of income. The decutor can ensure former on the basis of DOB on PAN card or Aadhar card or KYC documents available with them whereas latter condition of Income can be verified on the basis of the estimate of the customer. The banker can not ordinarily dispute income of the customer and has to accept it as it is. However, if the income received by the customer is known to the bankers being paid by them, then they can not escape from the liabilities if they accept the incorrect figures in form and latter on taxpayer defaults. Eligible deductee may now file form 15G/15H in paper form physically or submit the said form electronically after deductor like banks and others make necessary arrangements to provide such facility on their online websites. These customers may submit Form 15G /Form 15H by using the website of the banks. On receipt of this form, the deductor will not deduct tax and will allot a Unique Identification Number (UIN) to all self-declarations. It is to be noted that UIN should be separate for each type of form and quarter. The particulars of self-declarations made by the customers either through form 15G or 15H will have to be furnished by the deductor along with UIN in the Quarterly TDS statements of the deductor. The forms received in a particular quarter are required to be reported in quarterly etds return even if there is no deduction in that quarter. The requirement of submitting physical copy of Form 15G and 15H by the deductor to the income-tax authorities has been dispensed with. The department then will specify this information in 26AS of the concerned customer for verification and knowledge of the assessing officer. Deductor is required to retain the form 15G/15H for seven years. However as per section 197A(2) The person responsible for paying any income of the nature for which the declaration is made in form 15G/15H shall deliver or cause to be delivered to the Principal Chief Commissioner or Chief Commissioner or Principal Commissioner or Commissioner one copy of the declaration form 15G/15H on or before the seventh day of the month next following the month in which the declaration is furnished to him. Form No 15G or 15H can be filed only by residents. NRI can not fie this form. 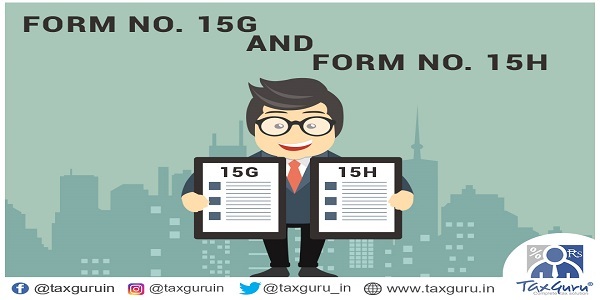 In form 15G /15H person has to provide details of Income for which form 15G/15H has been submitted. Getting a tax refund can be cumbersome for few as delays by the Income Tax Department are common. It makes sense to plan your taxes at the beginning of the year, to avoid over payment and the refund process. Submitting investment declaration with your employer on time and filling form 15G/15H will save your half the hassles. However, you cannot randomly submit forms 15G and 15H. There are certain precautions one should take while submitting these forms. Filing a wrong form without being eligible to do so would be illegal and could involve payment of interest on the tax payable and also attracts penal consequences. If your interest income exceeds 10,000 (Rs 50000 for senior citizen wef A.y 2019-20) a year, the bank will deduct 10% tax at source. If you do not furnish PAN details, the TDS rate will be higher at 20%. However, you can submit a Form 15G and 15H to avoid TDS on interest income subject to satisfaction of conditions. a) Who can submit form No. 15G? ii ) The aggregate amount of interest income etc. received during the financial year should not exceed the basic exemption limit i.e Rs 2,50,000 for the AY 2019-20 and onwards. If both these conditions are satisfied, Form 15G may be submitted to the deductor and entire interest income could be received without any deduction of tax at source. b) Who can submit form No. 15H? Any resident individual, who is of the age of sixty years or above can submit form No. 15H provided his estimated income is less than or equal to basic exemption limit i.e Rs. 3,00,000 for the AY 2019-20 onwards. This form can be submitted only by the senior citizen even though the total interest amount from the payer may exceed Rs. 3,00,000 (i.e., the limit of basic exemption limit). Imprisonment and fines await those who wrongly file the two forms to avoid tax on interest income liable for tax deduction at source. False statement in verification or delivery of false account, etc. (ii) in any other case, with rigorous imprisonment for a term which shall not be less than three months but which may extend to two years and with fine. Section 272B provides penalty in case of default by the taxpayer in complying with the provisions of section 139A or knowingly quoting incorrect PAN in any document referred to in section 139A(5)(c) or intimates incorrect PAN for the purpose of section 1 39A(5A)/(5C). Penalty under section 272B is Rs. 10,000. Respected Sir / Madam, It is a good article and does benefit many. Only crucial point is that the Form No. 15 H as quoted by you in the article says that “Income computed in accordance with the provisions of the Income-tax Act”. This obviously means that the Income arrived at after reducing the amounts of deductions available Under Chapter VI A of the Act. But, simultaneously, the article also quotes in the same Form No. 15 H that ” and the interest paid or payable to you does not exceed the maximum amount which is not chargeable to tax.”. Here lies the contradiction. A person may have Interest on deposits amounting to Rs.5,00,000 and is entitled deduction Under Sec 80C of Rs.1,50,000, Under Sec 80 D of Rs.30,000 and Under Sec 80 TTB of Rs.50,000. Under such circumstances, the Senior Citizen is not liable to pay Income-tax and the Bank has to accept the Form No. 15 G even though the interest component is Rs.5,00,000. Can you please be kind enough to clarify on this point. 1) Can the status of Form 15G be updated in the later part of the year if income is increased later. 2) If TDS will be paid from new source directly is it necessary to update Form G status or can be updated next year. 1) last year there was income with no tax payable, In beginning of this year also it was same. But in last 6 months there is new income which makes taxable. Can i withdraw or intimate bank to revise and remove form 15G status. 2) proper TDS on full income all sources will be paid from new income.Whether it is compulsory to update Form G status or can update in next year. I am 62 years old and my Total Income is below Rs.3.00 Lacs. I have submitted 15H to my bank but my bank requires me to submit 15H as and when I renew Fixed Deposit or make fresh Fixed Deposit with them during assessment year, Is It requred under Income Tax Rules to submit 15H every now and then ? I am 67 years old and I have interest income of Rs. 3.8 lakh including investment in Senior citizen saving scheme of Rs. 2 lakh as investment . Can I fill 15H form to save from TDS? 15H is for senior and super senior citizen while 15G is for Individual( Other Than Above) And HUF. kindly note this is Applicable for only indian citizens. Periodicity of uploading by deductor…..? in the 2nd para “Under the simplified procedure, a payee can submit the self-declaration either in paper form or electronically. Now my ? is how a payee can submit the self declaration electronicallyy.. Very good article about new 15G/15H form. my father aged 67 years has Total Interest Income Rs. 4.50 Lakh for year 2015-16. There is NO other Income. He invested Rs. 1.50 lakh In Tax saving deposit which qualify for tax exemption under 80C. Can he submit new form 15H? For financial year 2016-17 does he need to submit 15H only once in April for full year OR he need to submit 15H every quarter. Can you please clarify me that whether every Quarter UIN to be generated for single Assesse (deductee)? For ex.Mr. X has given 15G form to Bank in Quarter 3rd and subsequently the Bank has generated UIN in Q3…. So, whether the Bank should generate UIN again in the name of Mr. X? can Form 15G be submitted for by assesse for receiving payment for rent? A Very Good Article on Form 15 G/H I have ever come acrossed. Everything has been explained clearly and all the relevant conditions and clauses like eligibility requirements, penalties, etc have been explained in a proper sequential manner. Also,the example given above sums up the various parameters for submitting form 15 G/H for non deduction of tax on interest income — giving a clear understanding at a glance. I should say this is a one stop place for all the queries relating to Form 15 G/H. In 3rd condition of Form no. 15G the answer is wrong as it is not allowed. The revised form 15H restricts its submission on the basis of total (i.e. taxable) income. This is unfair to people whose total income is > the exemption limit of Rs 3 lacs (but less than 5 lacs) and yet they have no tax liability, due to deduction available u/s 87A (tax rebate of Rs 2,000/-. For example, assume for simplicity’s sake that a senior citizen has interest on fixed deposits say Rs 30,000/- but has a total income of say Rs 3,20,000/- after considering deductions under Chapter VI. Now he cannot submit form 15H, but his tax liability would be NIL due to rebate u/s 87A. However, as he cannot submit form 15H, the bank would deduct tax from his fixed deposits at source @ 10% which would be Rs 3,000/-. This person would then have to wait till the I-T Dept. gives him the refund after he files his tax return, which may take a long time. This would be a harassment of sorts to a senior citizen, particularly in these times of increasing inflation and reduced interest income. It is therefore submitted that the Govt. should allow form 15H to be submitted even if the total income is more than the tax exemption limit (currently Rs 3 lacs for a senior citizen), by adding a declaration on the form that there would be no tax liability on the assessee. This would mitigate the problem of senior citizens to a large extent. Even obtaining a certificate from the I-T Officer for non-deduction of tax is not easy and has obvious problems of visits to the ITO several times and inter-action with the Officer/staff. The I-T Dept. can always check if a person has filed his tax return, based on the PAN no. and submission of 15H, thus detecting whether the assessee has justified filing 15H. I request the authorities to consider this suggestion. Thanks for the update it’s very useful information. Please guide on UIN no. to be allocated. Is there any specific requirement regarding characterss and no. of digits? May i submit that u have in the guidance only discussed about individual/ HUF regarding Form No. 15G & 15H. In section 197A(1A) it talks about PERSON and as per section 2(31) person includes, refer clause V, VI & VII and accordingly does it mean that a charitable trust being approved and regularly assessed where the income is utilised for charitable purposes and there is no taxable income over last number of years is not permitted to form 15G/15H of Income Tax Rules. Please submit your comments in view of interest income received from banks. Charitable institution can not file these forms. They have to apply for non deduction of tax at sorce by filing form no 13 in the begining of the financial year. Well written article It seems intention of the immenient author is to make general awareness but it also given warning signals to both taxpayers and deductors .purpose of author is fulfilled .however article is silent about liability of joint account holder in respect of interest income . Article is well written in simplified way .Immenient author has warning signals for both taxpayers and deduct ors Intention of the article seems tobe make awareness in general and Dr Satbhai has accomplished the purpose .more focus was on interest income . How will deductor generate UIN no. Is not said. Very useful and helpful information. Covers all aspects of changes in form 15H & 15G. Advantages and features gives complete knowledge. 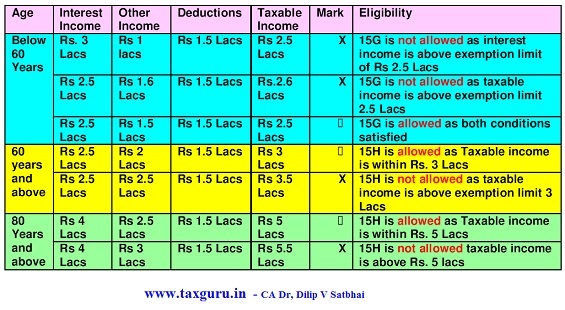 The table is very self explainetory and gives clear idea about concept of eligibility. I am forwarding this article to some of my friends ( bank employees ) as this is really helpful for them. Thanks Dr. D. V. Satbhai Sir. a very good informative article, we were waiting for with apt layman`s language. Kindly check whether “total income computed as per the provisions of the Income Tax Act is less than or equal to basic exemption limit or taxable income” in the given provision and example. forms in revised format as shown by you need a proper page break. one form merges into another.